On August 2010, astronomers announced that the HARPS spectrometer in Chile detected five planets orbiting the nearby star HD 10180. They used periodic variations in the star’s light (possible Doppler shifts) to calculate the approximate orbits of the proposed planets. 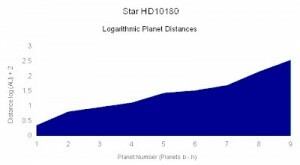 This is a graph of the logarithm of the estimated planet distances versus the planet sequences. The graph show an approximate straight line. Two hundred years ago, astronomers calculated that the known planets in our solar system followed a geometrically increasing distance from the Sun. 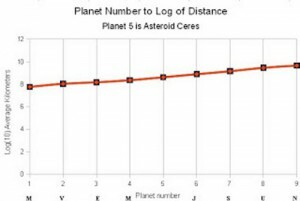 However, their sequence had an unexplained “gap.” Fifty years later, astronomers found Ceres in the “gap.” Eventually they discovered thousands of shattered planet pieces (asteroids) between Mars and Jupiter where the mathematical sequence predicted a planet. The graph on the right shows the distances from our Sun to the planets as a straight line on a logarithmic plot. 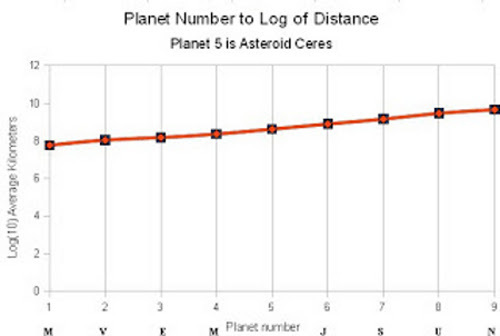 The “fifth planet” is Ceres and the asteroid belt. Why should local and distant planets migrate into geometric spacings? Scientists have at least 15 theories for how stars and planetary systems form. The accepted theory-of-the-moment is that stars and planets condensed from a molecular cloud with most of the matter falling into the star. According to this theory, the large gaseous, outer planets swept up more dust, which produced wider gaps around them. However, our Sun contains 99.9% of the matter in the solar system but only 1 % of the momentum. This is the opposite of what gravity theories predict from a spinning, collapsing cloud. Neither Newton nor Einstein’s gravity can explain the history of galaxies, stars and the record our ancestors claimed of the planets. We conjecture its existence by the motions of nearby objects and by comparing their weight. For Newton, gravity is a force that pulls planets toward the Sun. For Einstein, the Sun’s gravity bends the geometry of space so that the Earth, like a train, follows the local bends in the rails of space time. Neither Einstein or Newton can explain planets with logarithmic spacings. Yet billions of spiral galaxies have roughly logarithmically (increasingly) spaced spiral arms. Process gravity theory explains cosmic and solar history simply, without complex mathematics. Matter is changing relationally; it is an active process. Relational change is parallel change, where the properties of matter continually change in interconnected ways. Newton and Einstein’s theories were based on the medieval, scholastic assumption that the essence of substance is changeless. We observe in galaxies at many ranges how globs packed with stars emerged and accelerated out from their cores. In most spirals, the arms open outwards, continually spreading outwards. According to modern cosmologists, each galaxy is surrounded by a doughnut of invisible matter. They speculate that 84% of the matter in the universe is invisible. Why? None of their gravity laws work in galaxies without ad hoc stories about undetectable things: the spreading vacuum of space time and invisible matter. Gravity emerges from matter as it continues to change relationally. There are no independent variables in relational changes as all the properties of matter change together, in parallel. Galaxies visibly increase in volume, increase their light clock rates and apparently increase their inertia as they spread out. The fastest atomic clocks are nearby and the farthest galaxies shine at tiny fractions of the frequencies of modern atoms. Even local atomic clocks, when compared to their frequencies from hours ago (the Pioneer Anomaly) are observed to accelerate in the same manner as the light clocks in countless galaxies (correlating with distance). What does it mean: matter changes as it ages? The Genesis account explains how the universe began. God first created (completed action verb ) the entire universe (the plural heavens and the Earth). However, the Earth was (completion verb) unformed and dark. How did the Earth begin to have extension, to receive form? God continued to command light to continue to be. Indeed light dithers in unbroken continuity within all substances giving them extension and other properties. Matter is a relation with light, not independent, synthetic things like mass and energy. How did the Sun, Moon and stars form? According to the Hebrew text for the Genesis account, God continues to form them and continues to make them into spreading things (Hebrew word raqiya). He evidently formed them from the formless things he created first. Trillions of stars streams (globs packed with stars) emerging from point sources in the cores of countless galaxies at many ranges. About once a day, astronomers detect bright gamma ray bursts arriving from the early universe. Evidently this is God at work, continuing to command light to be, thus energizing and giving form to the matter from which the stars are forming. Once matter is energized with light, it continues to change itself relationally. At first the newly formed matter has minuscule gravitational properties (inertia). We confirm this is so because jets emerging from point sources in the core of galaxies do not bend until they distance themselves and begin to take up more volume. Jets emerge from tiny quasars that shine at different frequencies than the emerging streams. Even within the Milky Way, we observe dusty nebulae forming around Herbig Haro stars that continue to shoot out double jets. Everywhere in the universe, compact objects spread out. Even the Earth continues to increase in volume. The continents fit together on a minuscule globe and the seafloor is younger than the continents. New earth crust continues to form along a global volcanic expansion seam running through every ocean. The gif of the growing Earth is from Michael Netzer who permits distribution with attribution. What causes trillions of star streams to accelerate outward, in defiance of Newton and Einstein? Why do planets migrate into orbits with logarithmic spacings? The inertial properties of matter change as matter “ages” relationally. Wait! Gravity pulls inwards toward the Sun. How can planets spread out, when gravity is going in the opposite direction? Gravity propagates at the speed of light, as several experiments demonstrate. (Kopekin’s VLA experiment and Tang Keyun’s gravimeters during eclipses show that the speed of gravity is light-speed.) This propagation delay causes the Suns gravity to approach the moving Earth about 20″ ahead of us in our orbit. The Sun’s gravity pulls slightly more on Earth’s leading hemisphere (dawn) than on the trailing hemisphere (sunset). The aberration of the Sun’s gravity slowly torques up the spinning Earth as it concurrently pulls the Earth outward so that our orbit never quite closes. Gravity aberration shortens days and years together, even as the ratio of days in a year stays about the same. Since gravity aberration increases with distance, it steadily pushes the outer planets away more than the inner ones, resulting in logarithmically spaced orbits. In spinning spiral galaxies, the continuing process in matter (that change its properties relationally) and gravity aberration causes the star streams to accelerate outwards, following each other out into roughly logarithmically spaced star streams. Newton might claim, but the orbits are clock like. Please look at the history of our universe, the only history that we observe as it happened long ago. The atomic clocks and the orbits both accelerate together. This suggests that gravity emerges from matter as it changes relationally. Wait! According to the biblical genealogies, the universe is only 6,000 years old. Gravity’s aberration means that ancient days and years were vast geological ages, back when the tiny Earth orbited a red Sun. The steady torque from gravity aberration continually accelerates days and years. There are no constants in the visible universe. Everything is observed to change relationally as matter continues to change itself, which is a process. Look at cosmic history and you will see the non mathematical, visible evidence for how the properties of matter have been changing relationally since the galaxies began to spread out.